We are currently evaluating the project and exploring ways in which we could continue to offer composting facilities for local residents. St Nicks ran the successful York Rotters from 2004 to 2013. The project was set up with the aim of helping people to start composting or compost more effectively. It was a partnership between St Nicks and City of York Council who funded the project from May 2006. Over 110 volunteers were trained and between them they managed to give composting advice to over 13,800 York residents and recorded over 1,200 volunteer hours. This is an amazing achievement, one that St Nicks is very proud of. St Nicks will continue to promote home composting and will evolve the principles of the York Rotters project through an exciting new project ‘Rot n Grow’ that will not only encourage people to compost their kitchen and garden waste but to use this compost to grow plants. Most gardeners still use peat-based compost and we are keen to encourage them to use alternatives because peat bogs are a precious habitat in need of protection. 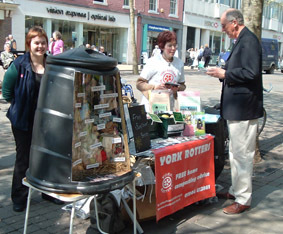 This Rot-n-Grow project will be a natural progression for York Rotters and the Ground to Table project which provided York Residents with free composting and gardening equipment to encourage them to grow their own fruit and vegetables.